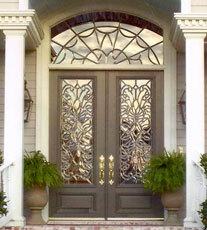 Doors of Elegance can now come to your home to add new life to your door! We start by sanding the exterior of the door, then we add concentrated stain to the marine varnish to give the door a more vibrant look and apply a coat of marine varnish. This will help keep your door looking new just like the day it was installed! *Door of the Month Special pricing is per door. See store for details.